“It seems that so many of the pains we have come from the psycho-somatic and from this energy accumulation. It can accumulate in the pelvic, in the knees, in the ankles, in the neck. It can give headaches, it can give rheumatism. I cannot treat any of these symptoms without a stethoscope. “There are two different psychosomatic pains. One is reactional and you get it because you have difficulty with stress in the here and now. The other is when the emotional defences go. The defences we are talking about are both psychological and physical. When the defences go you can be either neurotic or psychotic. That is when the energy is so strong and in those cases we can’t do any massage, we just hold it and the different sounds come. Then the psychosomatic pain goes. You see, stuck energy draws fluid and it also gives lower vibrations. The lower vibrations also give pain. It’s wonderful when people feel so light after a massage. That is the higher vibration. Then we come to the electro-magnetic principle in psychosomatic treatment. When the energy transforms from the lower to the higher vibrations then it becomes more electromagnetic and you feel so light. When you are happy you are light, when you are in love you are light, when you are healthy you are light. The body should be so light you forget that you have it. This is when the bio-electricity moves. “When Gerda Boyesen’s insights into the workings of the body, mind and soul-spirit came into my life, many of the hitherto inexplicable illnesses – sometimes known as idiopathic conditions, became less mysterious, less inexplicable. Mysteries remained, but a logic – a biologic – seemed to run though the person’s breakdown into illness and away from wellness and wellbeing. It seemed that health was no longer to be seen as an absence of illness but rather as an ability to progress through the illness, using it to move forward and beyond whatever it was that had caused a breakdown of communication between systems and cells. Gerda Boyesen recognised the physical manifestation of the unconscious (the id-instinctive drives) when she posited that the gut was the canal for the id energies. ‘Psychosomatic’ is a term used to convey the acceptance that the body and mind are linked in the development of some body and mind disorders. 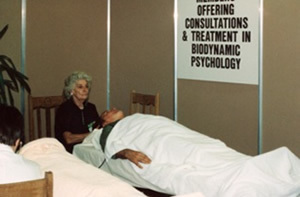 Biodynamic therapy is a holistic approach that has many clinical and therapeutic applications. It can help to relieve the suffering caused by all physical and nervous diseases, mental or emotional disorders and stress related conditions. It is particularly helpful with the following conditions: – stress, anxiety, depression, tension, Parkinson’s disease, coronary heart disease, pre and post-operative conditions, neck and shoulder tension, phobias, high and low blood pressure, irritable bowel syndrome, repetitive strain syndrome, migraine, pre-menstrual tension, infertility, grief and bereavement, loss, back pain, sports injuries and strains, chronic fatigue and so on. Psychosomatic treatment includes the physical treatment of physical and mental symptoms of stress and physical and/or nervous diseases and conditions, and the treatment of immune related diseases and conditions. It also includes “psychogenic” conditions (a term used to convey the understanding that an illness may be the result of a psychological disorder) in accordance with the principles, theory and practice of biodynamic psychology and psychotherapy.